Phoenix, Chandler, Mesa IT Services & Support | CCT247.com / Managed IT Services / Why Should You Get On The Cloud? 1. Connectivity – Being on the cloud gives you unparalleled connectivity to your data—from anywhere and at any time. All you need is a device that can connect you to the web and you are set! 2. Save On Hardware Costs – Using the cloud for certain programs spares you the cost of investing in specific hardware. Even devices as simple as your smartphone or a tablet can help you access those applications so you don’t have to spend money on dedicated hardware. Studies have shown that cloud users end up enjoying as much as a 17% IT cost reduction compared to their non-cloud counterparts. 3. 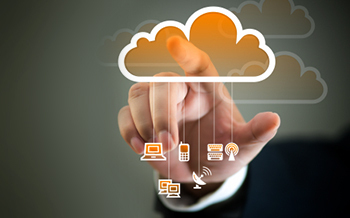 Cloud Enables SAAS – The cloud allows you to use software as a service. Microsoft 365 is one such example. When you use software as a service, you enjoy certain benefits such as more regular updates at a lower cost and the ability to have anyone work on the program for you by sharing the access credentials with them. 4. More Efficient Use of IT Staff – Moving to a cloud-based environment puts the burden of maintenance and downtime reduction on your service provider. That means you can use your limited IT staff more efficiently and also don’t have to worry about the costs associated with such maintenance or downtime. 5. Improved Productivity – Studies have shown that cloud users enjoy better productivity than their non-cloud counterparts. This could be because cloud service providers are better equipped to handle any IT eventualities than the average SMBs. So, perhaps it’s time to ‘get cloudy’ and enjoy all that the cloud has to offer your SMB. And…if you need help in doing that, we are just a phone call away!